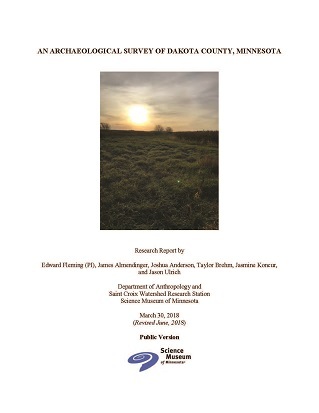 The Office of the State Archaeologist (OSA) recently posted several reports for surveys funded by the Arts and Cultural Heritage Fund of the Minnesota Clean Water, Land and Legacy Amendment on its website. The recent posts include county surveys for Le Sueur and Lac qui Parle Counties, a report on radiocarbon dating in Minnesota and an overview of the Archaic in Minnesota. 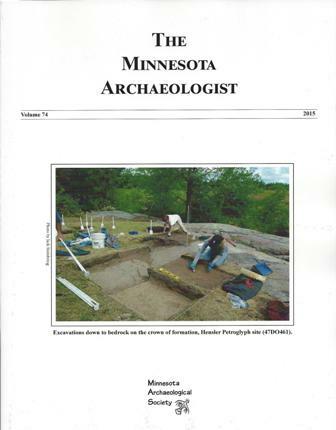 The latest issue of the Minnesota Archeologist (Volume 74) has been published. 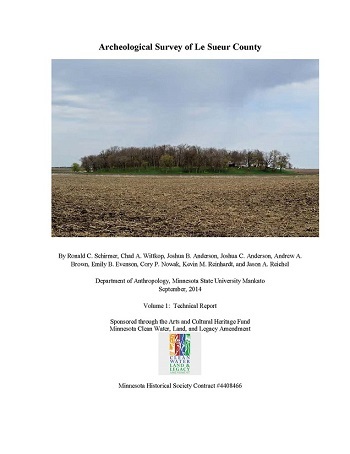 Articles include the third installment of the history of Minnesota archaeology by Guy Gibbon and Scott Anfinson focusing on the period of the 1970s to 2015 looking at cultural resource management archaeology. David Maki, Sigrid Arnott and Michael Bergervoet examine the relationship between burial mound locations and the geophysical evidence for lightning strikes. Jack Steinbring presents some optically stimulated luminescence dates from the Hensler Petroglyph site in east-central Wisconsin suggesting that some of the glyphs date to before 10,000 BP. A multi-component Woodland site in southeastern Minnesota excavated in 1997 by the MnDNR Division of Trails and Waterways, 21HU0167, is reported on by Timothy Tumberg. Dan Wendt and Mark Doperalski assess the limits of raw material analysis and identification by archaeologists in Minnesota, discussing how they are doing and means of improvement. Kent Bakken documents a biface cache from Todd County, Minnesota consisting of 12 minimally worked bifaces made of non-local materials, specifically Mayes Creek Chert and Burlington Chert. Plant microfossils (starch granules and phytoliths) were examined by Alexandra Burchill and Mathew Boyd to provide a better understanding of the plant foods utilized by the Initial Woodland inhabitants of northern Minnesota. Mathew Mattson discusses using traditionally available tools and methods to work raw copper obtained from glacial drift to produce copper tools consistent with archaeologically recovered specimens. David Mather continues his series on Minnesota archaeological sites recently listed on the National Register of Historic Places including two American Indian earthwork sites, an historic stagecoach road and associated archaeological sites, and a multicomponent habitation/mound site in a national forest. The issue concludes with an article in memory of Herb Wright and his contributions to archaeology authored by Scott Anfinson. Follow this link to see the table of contents http://mnfieldnotes.com/wp-content/uploads/2017/05/Volume-74.pdf . If you would like to order a copy contact the Minnesota Archaeological Society. You can email Kent Bakken at bakk0029@umn.edu or Anna Morrow at anmorrow@q.com . They can also be reached by mail at The Minnesota Archaeological Society, Fort Snelling History Center, 200 Tower Avenue, St. Paul, MN 55111. 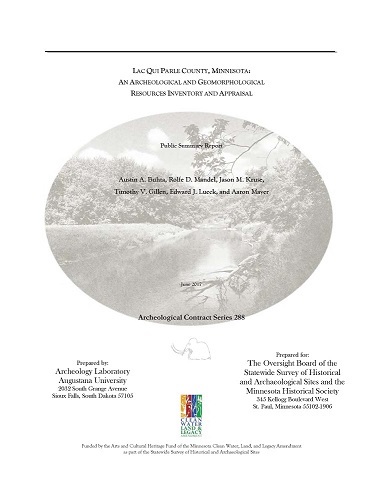 A survey report recently posted by the Office of the State Archaeologist details the results of an archaeological and geomorphological study of the Minnesota River valley, The Minnesota River Trench: An Archeological and Geomorphological Study of its Prehistory and Settlement by Austin A. Buhta, Rolfe D. Mandel, Michael G. Michlovic, Eric C. Grimm, and L. Adrian Hannus. The primary goal of the study was to determine where prehistoric archaeological sites are located within the valley and to determine whether there are settlement patterns present among the primary prehistoric cultural traditions that are present in the valley. The second focus was to evaluate a known, possible, paleoindian site (21LP0011) in the river trench. Excavation at an intact paleoindian site within the valley could help understand some of Minnesota’s earliest occupants and would also provide information on the timing and character of Glacial River Warren, which formed the Minnesota River valley as Glacial Lake Agassiz’s southernmost outlet. The geomorphological study helped to determine what landforms within the river trench would have been available for habitation at a given period in time and also explained how erosion and channel migration would have modified or destroyed any archaeological sites present. The archaeological study used information from previously recorded sites along with field survey of 1,446 acres to ascertain site locations within the river valley. Erosion and sedimentation have resulted in a low probability of surficial sites within the valley. Recent work has documented that colluvial and alluvial processes have buried sites in the lower Minnesota River valley under meters of sediment. This technical report will likely be of more interest to professional archaeologists rather than avocational archaeologists, however the section regarding the excavations at site 21LP0011 is an interesting read. At this site the archaeologists try to determine the age of the major component of the site without the advantage of diagnostic artifacts or datable material recovered from their excavations. The Office of the State Archaeologist recently posted a digital version of a new stone tool identification guide for Minnesota. 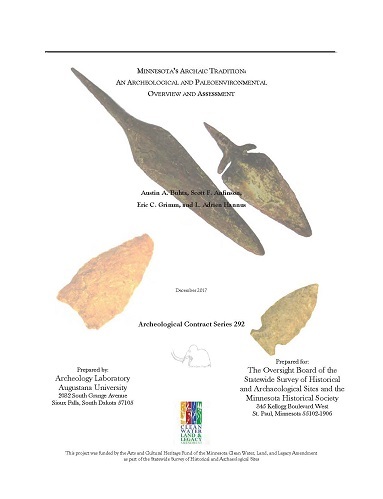 The publication titled “Stone Tools of Minnesota” was authored by Toby A. Morrow with contributions by Scott F. Anfinson, Kent E. Bakken, Guy E. Gibbon, Michael D. Giller, John H. Hahn, Daniel K. Higginbottom, and Craig M. Johnson. 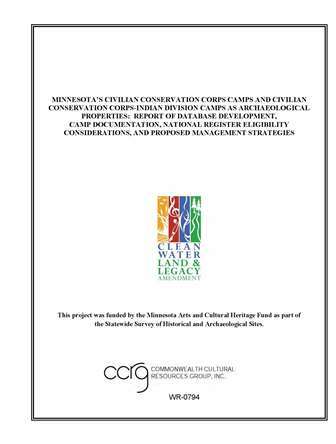 The project was funded by the Arts and Cultural Heritage Fund of the Minnesota Clean Water, Land, and Legacy Amendment as part of the Statewide Survey of Historical and Archaeological Sites. The book is more than just and identification guide to Minnesota’s stone tools, but a textbook on lithic materials and lithic technology in Minnesota. For example, the introductory chapter includes sections on; objects commonly mistaken for stone tools, facts about fakes (modern reproductions), how we have learned about stone tools, and lithic use wear and residue studies (plant residues including starches and phytoliths and animal residues like blood). 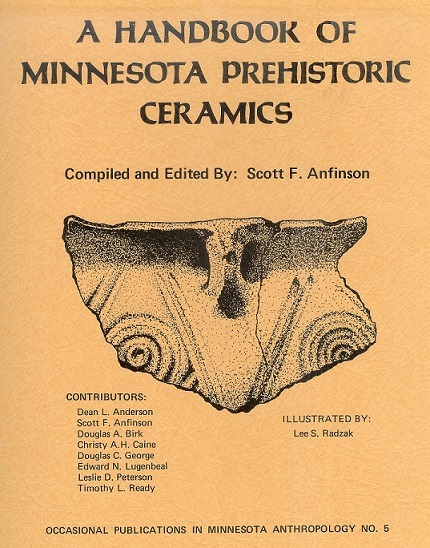 Besides the Introduction, chapters include; A Brief Primer in Geology; History of Lithic Analysis in Minnesota (Anfinson); Chipped Stone Tools; Projectile Points; Chipped Stone Raw Materials (Bakken); Ground Stone Tools; and a chapter on Future Directions which suggests the directions future studies to understand and analyze stone tools should take. The book is heavily illustrated with excellent color photographs showing the artifacts full size and is over 400 pages in length. It has something for both the avocational and professional archaeologist. Due to the size of the digital file it was posted as two downloads. Part 1: http://mn.gov/admin/assets/stone-tools-of-minnesota-part1_tcm36-247478.pdf (14MB) and Part 2: http://mn.gov/admin/assets/stone-tools-of-minnesota-part2_tcm36-247479.pdf (17MB). At this time there are no hard copies of the report available, the Board of the Statewide Survey of Historical and Archaeological Sites is working on getting it published. 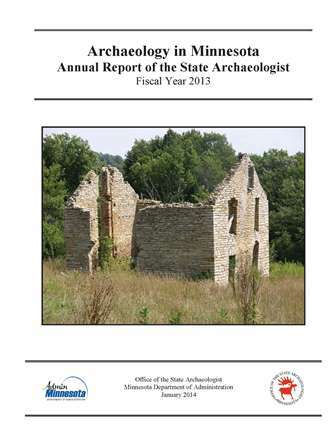 The latest volume of The Minnesota Archaeologist has been published , Volume 73, 2014. This issue covers a range of topics from historic through precontact periods. There is a transcript of the diary of Alexander Ramsey’s travels in the Mississippi Headwaters, excavation reports from precontact sites in Blue Earth and Cottonwood Counties and two discussions of Prairie du Chien Chert sources. 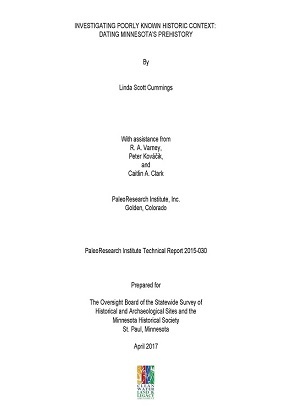 Also included are a review of recent underwater archaeological surveys across the state and Part 2 of a history of Minnesota archaeology. Follow this link to see the table of contents. 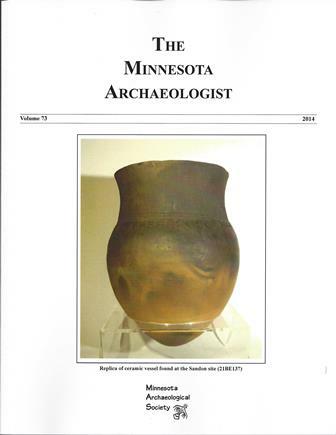 For information on how to obtain a copy contact the Minnesota Archaeological Society. The Office of the State Archaeologist (OSA) has released its Annual Report, a summary of activities undertaken by the OSA for the 2014 fiscal year. Anfinson also includes overviews of other archeological activities across the state. The Office of the State Archaeologist (OSA) has recently made a couple of additional Legacy funded project reports available for download. The first is titled MINNESOTA’S CIVILIAN CONSERVATION CORPS CAMPS AND CIVILIAN CONSERVATION CORPS-INDIAN DIVISION CAMPS AS ARCHAEOLOGICAL PROPERTIES: REPORT OF DATABASE DEVELOPMENT, CAMP DOCUMENTATION, NATIONAL REGISTER ELIGIBILITY CONSIDERATIONS, AND PROPOSED MANAGEMENT STRATEGIES and was completed by the Commonwealth Cultural Resources Group, Inc. (CCRG). CCRG developed historic contexts, visited and documented 10 Civilian Conservation Corps camps, and then developed proposed strategies for camp documentation, evaluation, preservation and interpretation. Click here to download. The second report, ON THE PERIPHERY? 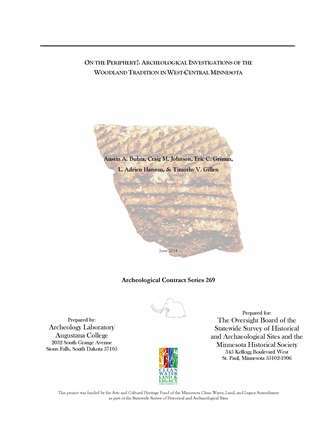 : ARCHEOLOGICAL INVESTIGATIONS OF THE WOODLAND TRADITION IN WEST-CENTRAL MINNESOTA was prepared by the Archeology Laboratory at Augustana College. The primary goal of the investigation was to expand the breadth of knowledge concerning west-central Minnesota’s Woodland tradition. The project conducted limited test excavations at three previously identified Woodland sites and obtained a lakebed sediment core, all in Kandiyohi County. The study also examined a series of Woodland-period ceramic collections from both the west-central Minnesota study area and the broader region. Results of the study suggest that the occupants of west-central Minnesota during the Woodland period had closer ties to peoples in eastern, rather than southwestern, Minnesota. Click here to download. Both reports are heavily illustrated, however these public versions have been edited to reduce their file size to make them faster to download. Editing removed some of the appendices and exact site location information. Complete versions are available from the OSA. 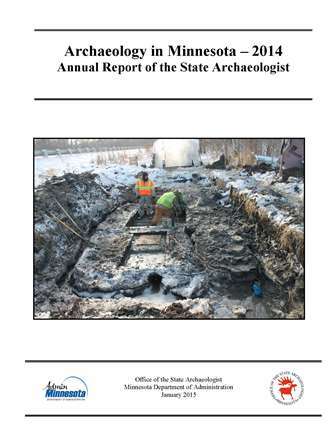 The Office of the State Archaeologist (OSA) recently posted its Annual Report on Archaeology in Minnesota to their website. Also added was the annual summary of project reports in the state. Check them out.